Jurassic Park was my first pure play science movie having only watched children’s science fiction movies before that. I was in high school at that time and that movie was one of the truly mind blowing ones for me. It made so much waves that it is needless to mention that is a 1993 Steven Spielberg movie. That was when I for the first time, became familiar with the name of Steven Spielberg. This story based on a novel of the same name by Michael Crichton revolves around a park where dinosaurs have been recreated using genetic engineering by a team of scientists. There have been some accidents in the park and some experts are sent to investigate. The businessman who runs the park, his grandchildren and the three experts are the protagonists in the movie. 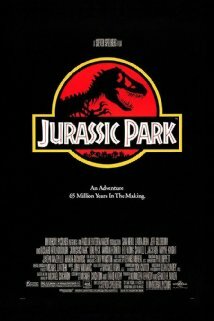 Initially the movie starts on a lighter note with the audience getting a tour of the park along with the protagonists and all the wonderful Jurassic scenery and the life like dinosaurs created through computer graphics. Things start getting exciting as the security systems start failing due to the actions of a corrupt technician. From there on the movie turns into exciting action with the protagonists splitting into two groups and each group escaping from various dangerous situations involving mainly two dangerous dinosaur species – the tyrannosaurus and the velociraptor. A third group is meantime works in the control room trying to restore controls. The movie ends with all the protagonists escaping alive while many of the supporting cast wind up dead. In terms of science fiction concepts, the idea of recreating dinosaurs is the key concept. The explanation of how it is done is also given – by extracting the DNA from mosquitoes from the time of the dinosaurs that have sucked the blood of these creatures and then been caught in amber and hence preserved intact over the ages. At least to a layman this feels like a sound theory. The key theme being explored is the interaction of humans with these pre historic monsters that existed many years before man came into existence. The idea itself is not new and was explored by Arthur Conan Doyle many decades earlier. Arthur Conan Doyle’s novel does not involve humans recreating dinosaurs and managing them in a park as such. Instead we have them in their wild state preserved from the Jurassic age in an area of the Amazon jungle that escaped whatever catastrophe caused the rest of the species to go extinct. They movie has two key attractions for the audience – the fascination of exploring a completely new world and the excitement of the chase. Development of computer graphics has created an opportunity to really explore fantasy themes on the silver screen and Jurassic Park was one of the first movies to exploit this opportunity. The scenes were so breathtaking that they remained etched in my mind for the next week or so after seeing the move. The excitement of the chase is the typical stuff in any action movie – protagonists beings chased by dangers and having a near escape making use of their intelligence, ingenuity, physical strength and sometime just luck. Only the dangers change from movie to movie. Here the danger takes the form of the two malicious dinosaur species– tyrannosaurus and velociraptors. With the good graphics, all the excitement feels all the more real to the viewer. Some of the other themes are the exploration of relationship between the protagonists. Action movies really don’t have much time for this aspect but always some of it is included to make characters seem more human and make the viewer relate to them. Here we have two children, brother and sister and a grandfather bringing the family angle. There is the romance angle with the girl, a teenager falling for one of the male protagonists and also there is something between him and one of the female protagonists as well. Then there is some friendly camaraderie between the other male protagonist and the children. So we have all kinds of relationships and characters from various age groups and genders so that the viewer can easily find someone to relate to. Since this movie is based on a book and I have read the book as well, I would briefly like to touch upon where the movie deviates from the book. One of the things that the movie does not delve deeply into is the central theme of theory of chaos around which the book revolves. The story in the book revolves around a theory that a system beyond a certain level of complexity cannot be controlled and will through its own internal contradictions collapse. The park is supposed to be the entity with that kind of complexity and the protagonist who is a mathematician theorizes that such a park can’t be sustained. Though we have the mathematician character in the movie, this idea is not stressed upon as something so conceptual is difficult to portray in a film. The other difference is that while the book has a much darker tone, the movie gives a by and large positive feel. So actually in terms of entertainment I enjoyed the movie much more than the book. Overall I would say this is one of the must see movies of the Twenty First century. It has really charmed people cutting across genre preferences. The idea has been so popular that the movie producers have been able to milk the franchise for three additional sequels and a fourth one is in the pipeline as well. Jurassic Park was a breath of fresh air in science fiction based productions which largely revolved on outer space. Of course, there were movies like War Games, Robocop, Warning Sign etc. You are doing a marvellous job putting up reviews of the movies travelling down the timeline of your life. Thanks, Umashankar. I somehow missed all the movies you mention. Maybe should remedy that now. "The Lost World" I think is the Doyle book. This was indeed an iconic movie. Right, Suresh. I avoided mentioning the name to avoid confusion with a book of the same name written by Michael Crichton movie as well written with the same name. Doyle's book was also made into a movie - a shoddy B grade movie I think.